Several years ago, the author had a dream in vivid colors. She was gazing from the upstairs back porch of her childhood house, across the 4 back yards of the neighbors’ houses. Each yard was one of the 4 seasons. These 10 poems offer solace and serenity in the midst of winter, ostensibly the coldest time of the year. 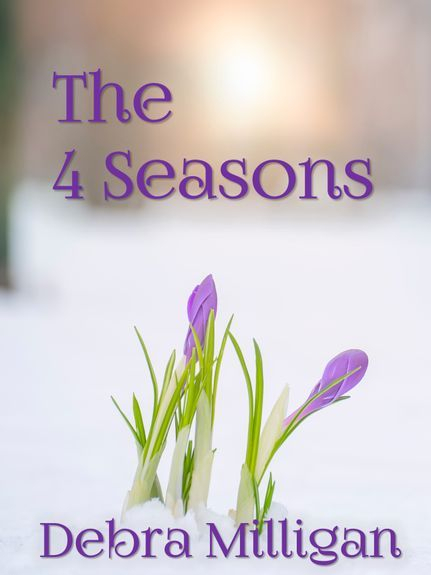 The themes include the lonely heartache that only love can soothe; the gift of love in the midst of the barren cold; meditation; personal growth; the warmth of memory; reclaiming your heart from the heartless encounter. One warm day in February 2016, it was suddenly spring. The author was out for a walk in the country and she felt the blossoming of this poetry. Two days and 12 poems later, Debra Milligan reached the right tones for her poetic sounds: beauty, harmony, girlhood, remembrance, love, fury, forgiveness, renewal, the soaring freedom of reverie. Like a melody within memories, the song of summer captures time in many ways. These 9 poems evoke the eternal within the ephemeral; they sing with images about passion, the contented life, the colors of summer desire, children, lessons of betrayal, the silent vow of true love, the flowering of creativity. A season for retrospection and remembrance, autumn can also yield the harvest of delight and dreams of wonderment for the future. These 12 poems speak of the warm embrace of autumn, memory and longing, letting go with love and holding on with fear, the education of the female heart, the prospect of art and the promise of life, faithful love. This volume of poetry reflects upon the past but also radiates with hope for the future.